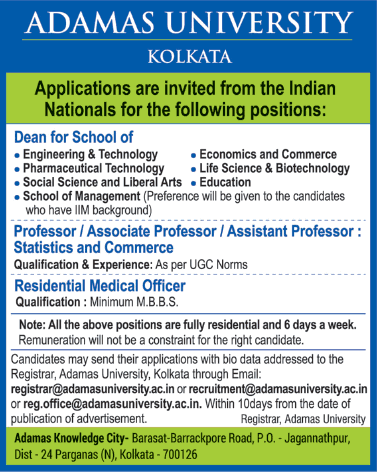 Adamas University, Kolkata has advertised in THE TIMES OF INDIA newspaper for the recruitment of Teaching Faculty- Professor / Associate Professor / Assistant Professor / Dean Plus Non-Faculty jobs vacancies. Interested and eligible job aspirants are requested to apply within 10 days from 23rd January 2019. Check out further more details below. About University: The Adamas University has been established by the Sachis Kiron Roy Memorial Trust (SKRMT) under The Adamas University Act, 2014 (West Bengal Act IV of 2014) passed by the West Bengal Legislature and approved by the Governor. The provisions of The Adamas University Act, 2014 have come into effect from 11th April 2014 through a notification issued by the Government of West Bengal on the same date. How to Apply: Interested and eligible candidates are requested to send CV along with copies of certificates and recent PP size photographs to the following postal address or email address given below. Kolkata - 700 126, WB, India.